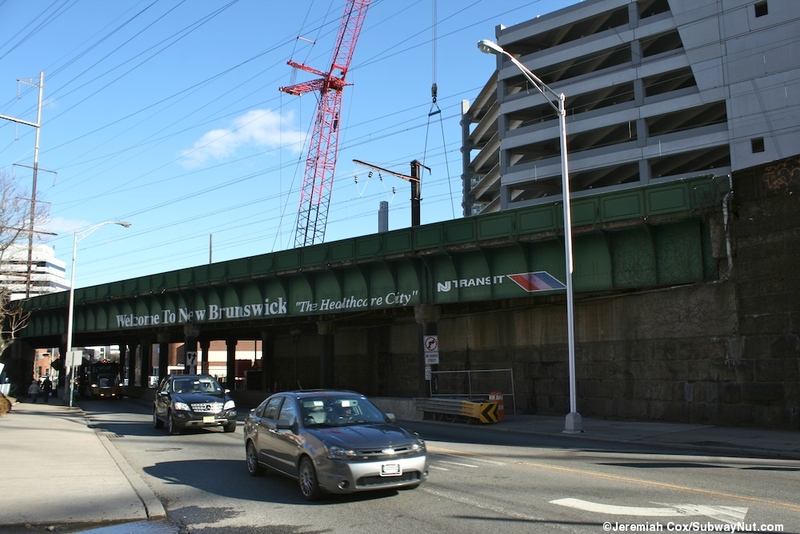 New Brunswick is a Northeast Corridor Station on an elevated viaduct in the center of the Healthcare City. 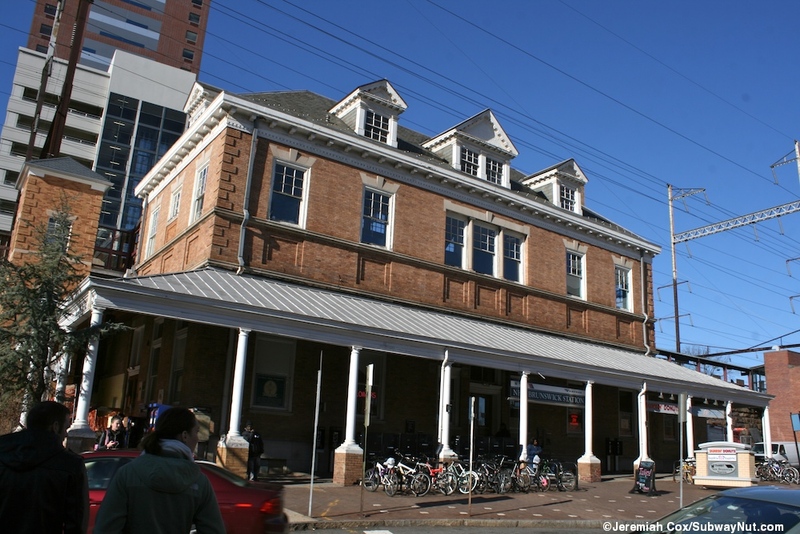 The current station, including its two-level Colonial Revival, brick Station House was completed in 1903 although the stop did open originally with low-level platforms, high-level platforms are more modern built in the 1980s. 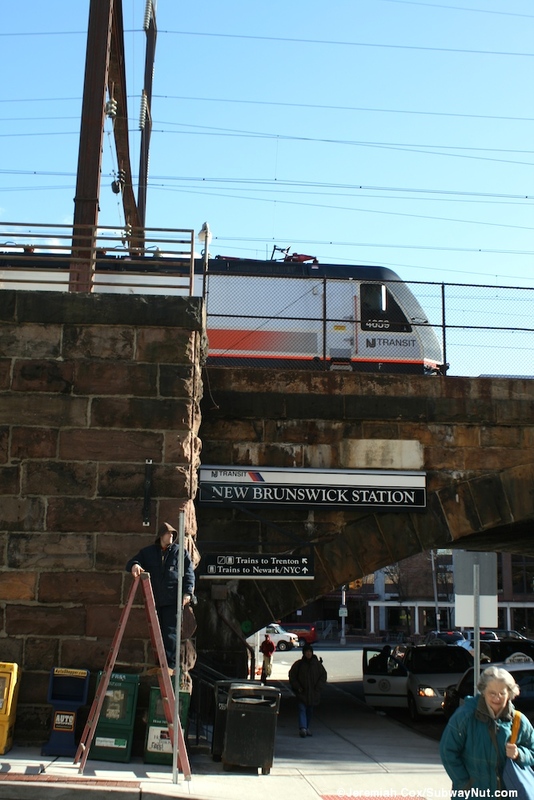 The station receives base service from New Jersey Transit about every half-hour throughout the day on both weekends and weekdays with much more frequent service in rush hour, only a few Trenton Expresses (which run non-stop to Princeton Junction bypass the station). 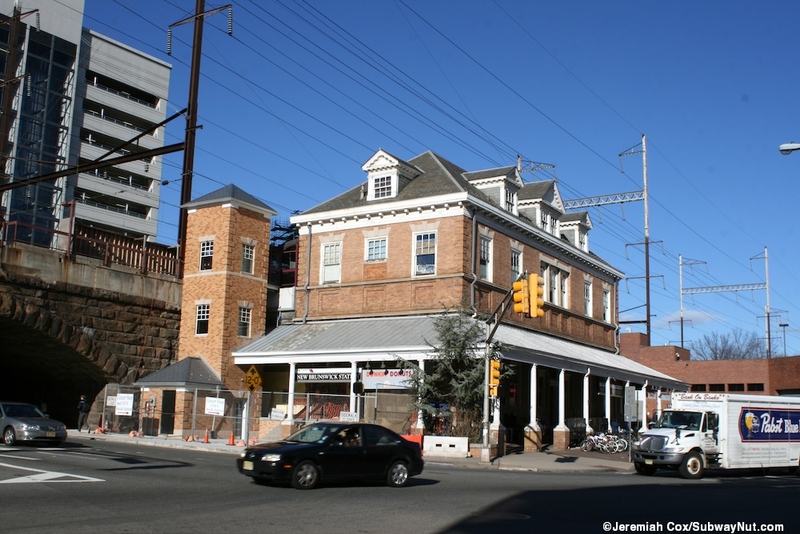 Amtrak service has slowly declined over the years mostly because of the decrease in service from the Clockers (local Philadelphia to New York trains), which New Jersey Transit contracted with Amtrak for to accept their monthly tickets in the 1990s until they were finally discontinued in 2005. 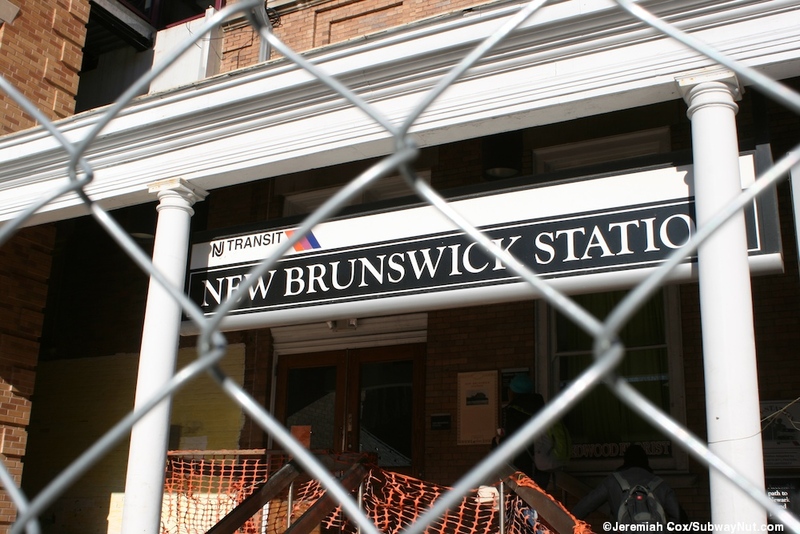 The slots were taken over by New Jersey Transit becoming regular rush-hour NJT Express trains and cut-back to Trenton. Today, just one Northeast Regional Train stops per weekday: an early morning southbound train (#181) at 6:45am to Washington, DC and a northbound evening train (#196 or #136, Fridays extended to Springfield) at 7:53pm with Washington arrival and departure times (9:40am and 5:05pm) ideally timed though for a day of business. An additional weekday northbound Keystone train (#652) also stops at the station at 6:04pm. The New Jersey Transit ticket office (open from 6:00am weekdays, 7:00am weekends to 8:00pm daily) has a sign outside saying Amtrak tickets sold here, a very unusual arrangement; at nearly all other shared stations Amtrak always has its own ticket window or (in the case of the three stations shared with Metro-North's Hudson Line) just provides a Quik-Trak Machine for its passengers, those paying with cash must pay onboard. 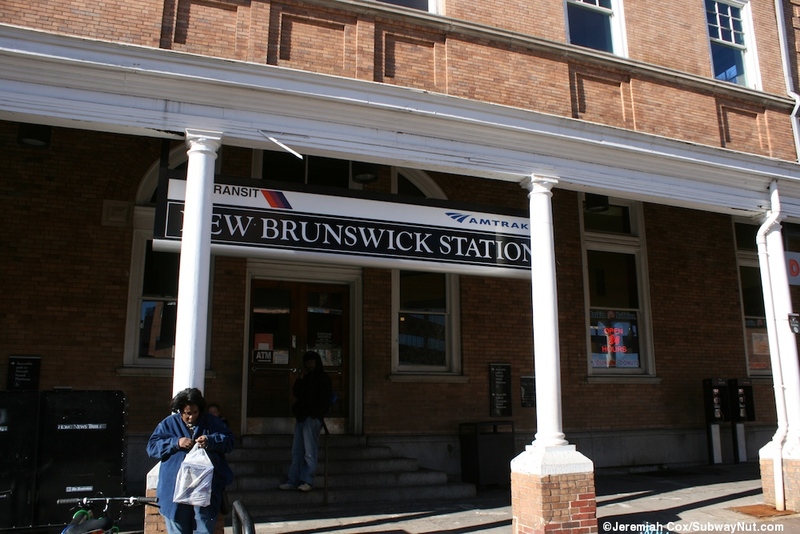 Amtrak's website shows the station as staffed (although its hours are slightly incorrect) even though its by a New Jersey Transit and not Amtrak employee. TVMs are located in the main waiting room for New York-bound passengers plus a few on the Trenton-bound platform for those passengers. 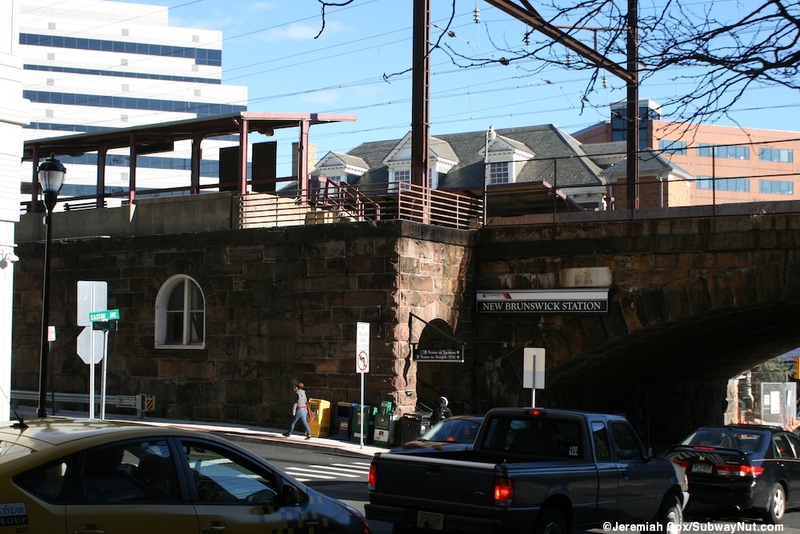 The station itself has two high-level side platforms along the four track Northeast Corridor Main Line. There is luckily no fence running down between the tracks to hamper photos. The platforms were definitely low-level when the station opened and it got high level platforms sometime between 1975 and 2000, at this point the non-historic platforms with pink lampposts were added and posts holding up generic pink canopies that run on each platform from their southern (Trenton-bound) ends to about midway for the New York-bound platform and for about just the first quarter of the length of the Trenton-bound platform, both are 8 cars long. At the southern end of both platforms are small low-level platform remains that lead to two wooden crossings in case a train needs to make a stop on a middle express track (never done in regular service). 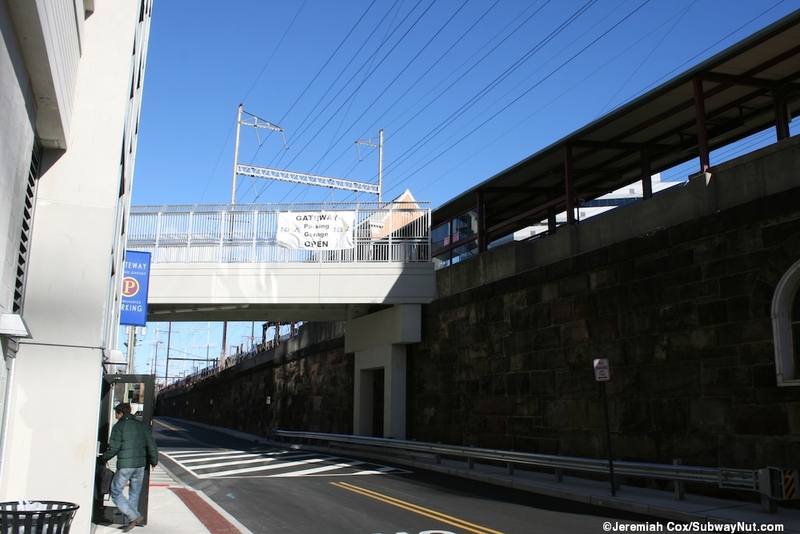 The Trenton-bound's low-level platform is fully gated off; the New York-bound one has an entrance at the NW corner of Easton Avenue and Albany Street. From here passengers take a modern staircase structure up to a narrow fenced off path before taking a few more steps up to the end of the high-level platform. 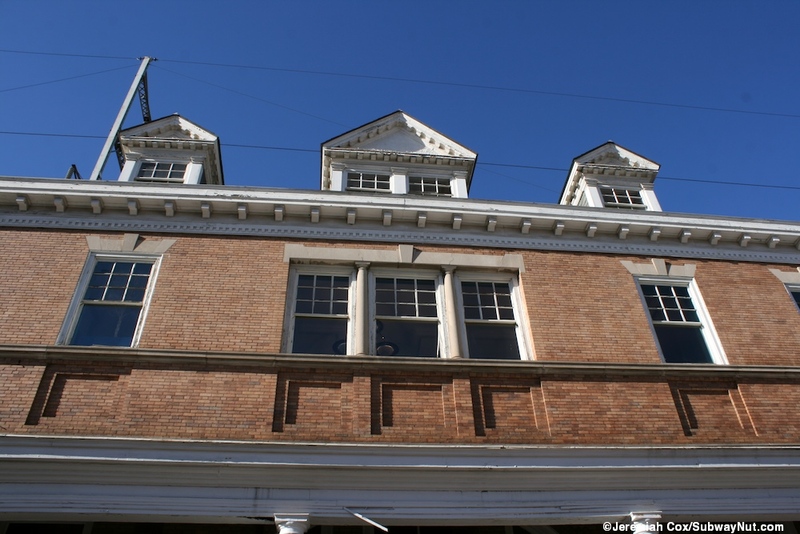 The main depot is the historic two-story brick building. 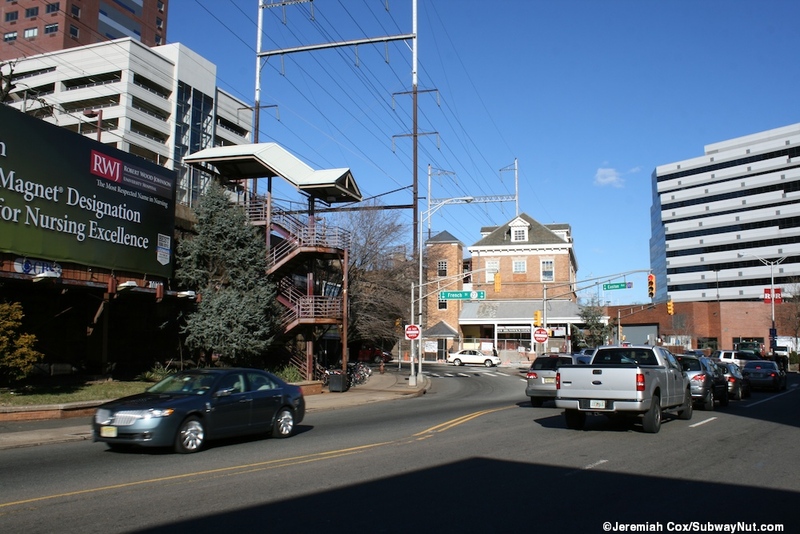 It is located on the New York-bound side of the tracks at the NE corner of Easton Avenue and Albany Street. Easton Avenue crosses under the viaduct beneath the tracks just south of it. 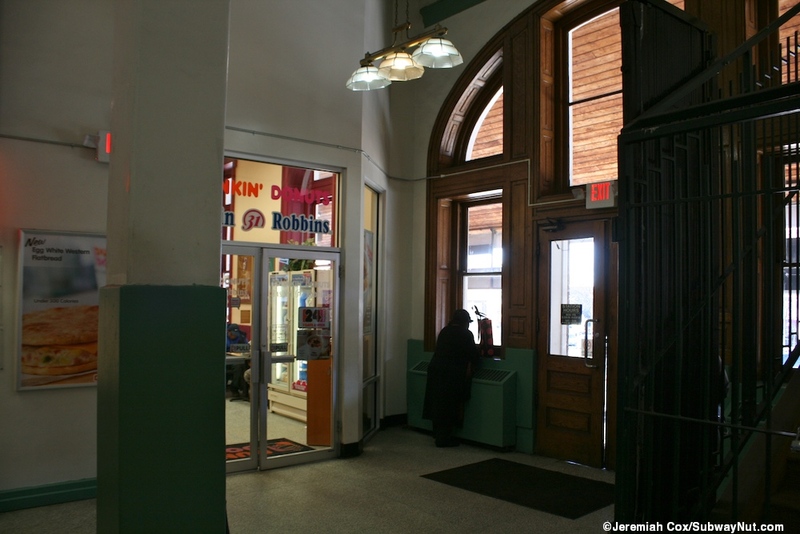 The street level entrance to the building mainly has a 24 hour Dukin' Donunts/Baskin Robbins and includes historic molding and paneling. There is also a flower shop. 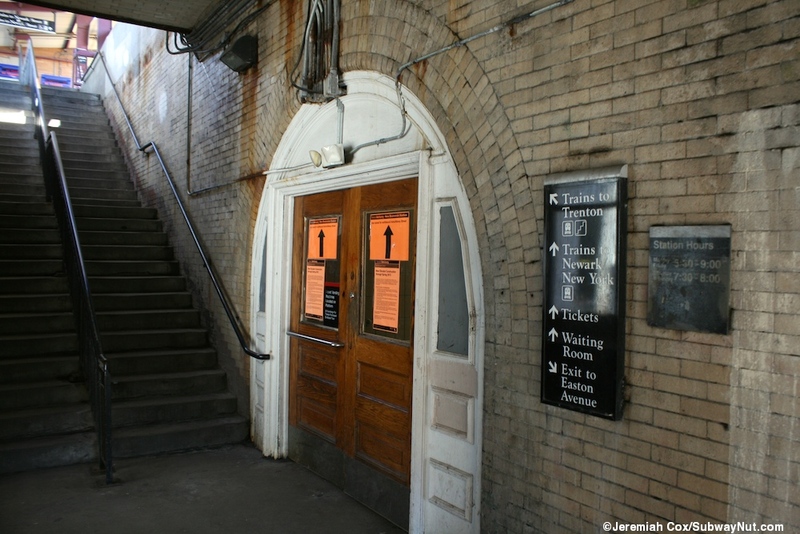 A narrow tunnel (with generic tiling) leads across to a door directly at a staircase up to the Trenton-bound platform and a few more steps down to Easton Avenue on the side of it opposite the station. 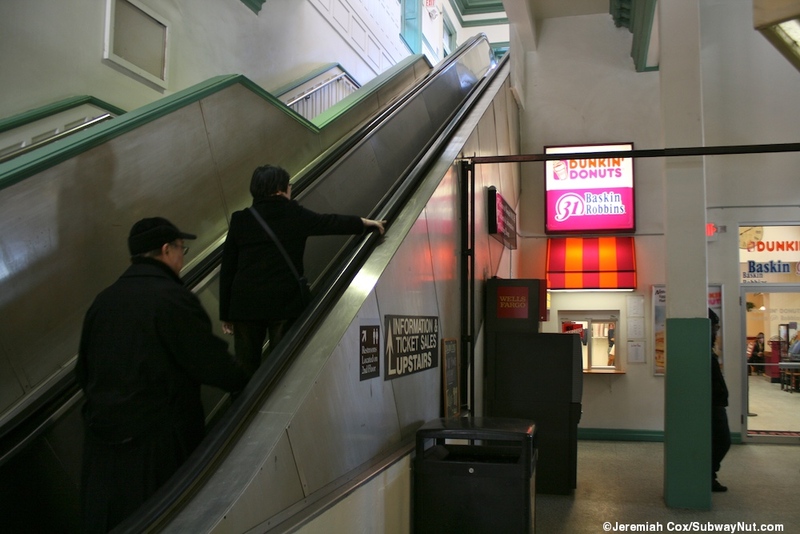 A staircase alongside an up escalator connects to the upper level. 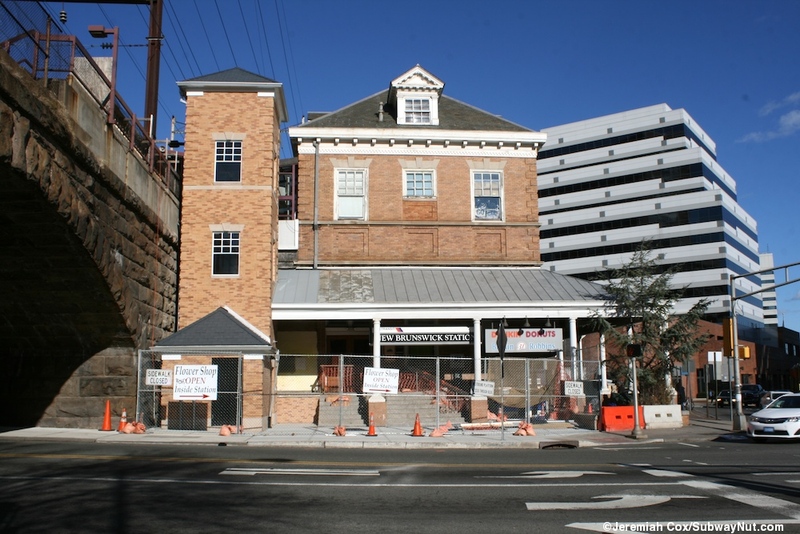 This is where the ticket office (two windows) waiting room and restrooms are. 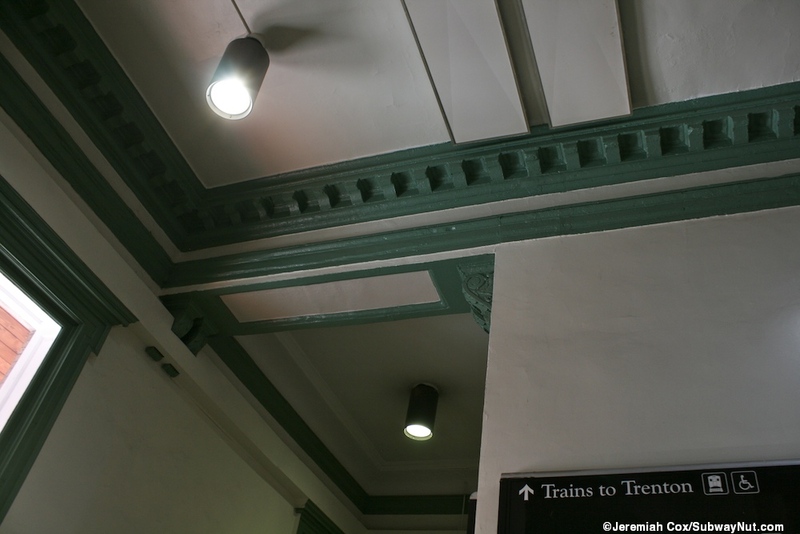 It is painted white with green trim an non-dispirit (for the historic nature of the station) light fixtures. Most of the benches for waiting passengers are long, wooden and also painted green. 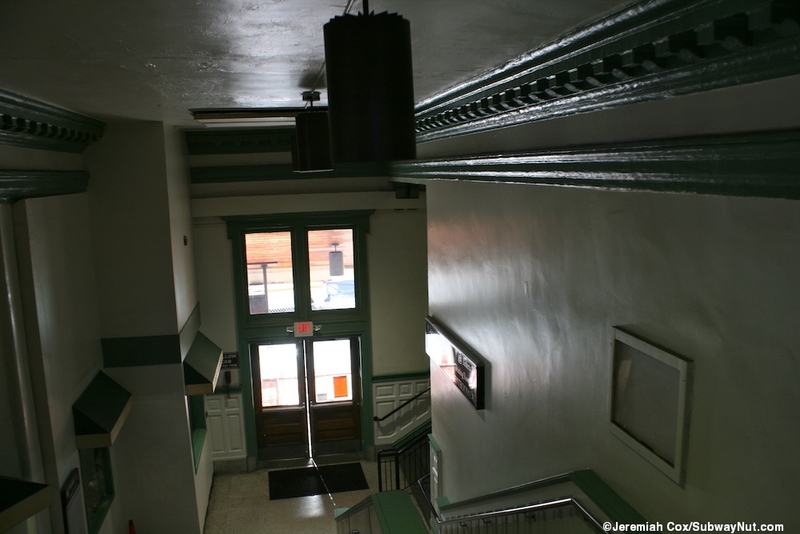 There is some bare wood polished paneling along the top of the stairwell. 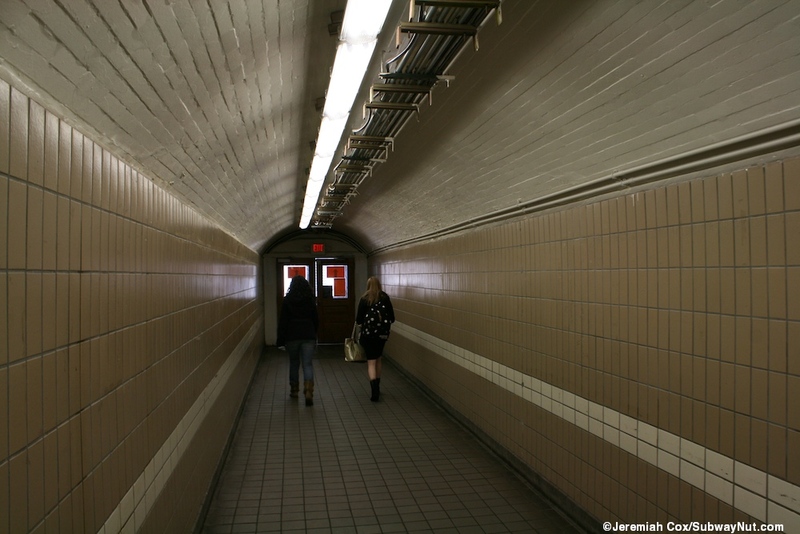 Two doors lead out to a few steps and a ramp up to the high-level New York-bound platform. 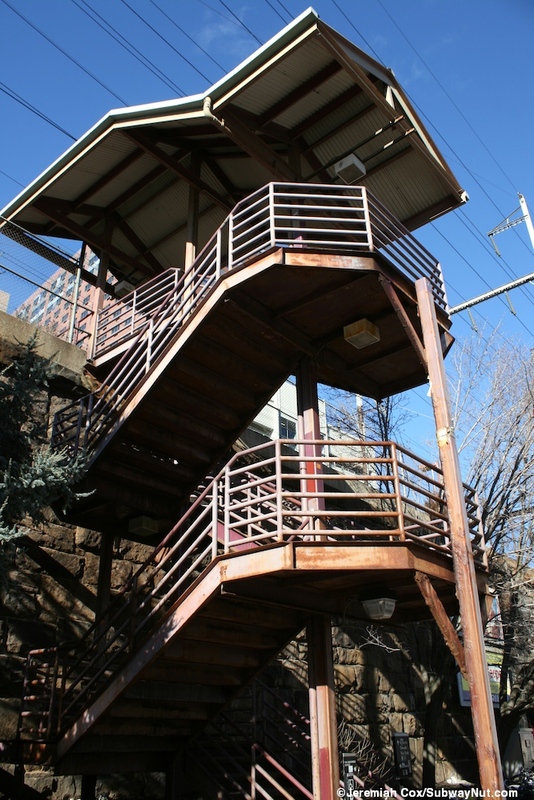 The elevator for the New York-bound platform is next to the depot and clad in bricks to look historic. 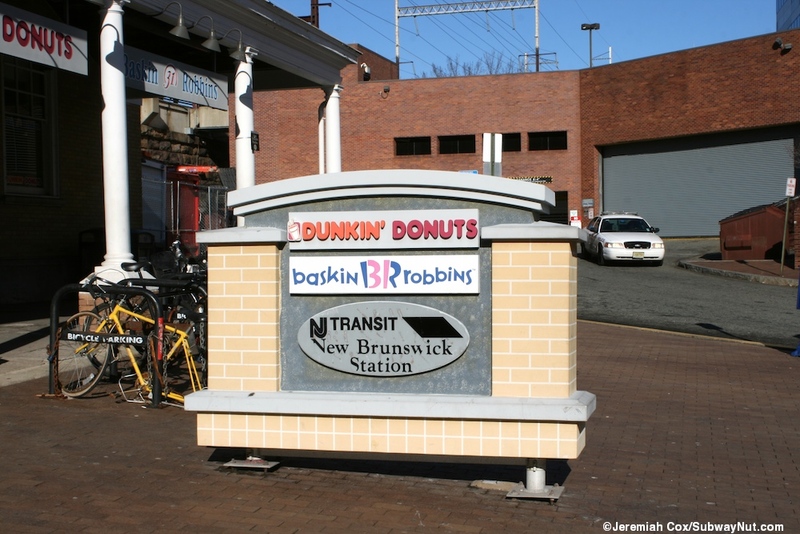 The Trenton-bound platform at this location has a small, recently built, in the style of the historic depot, brick waiting shed with doors leading to benches inside where passengers can wait in climate controlled comfort. There is also an overpass completed in 2012 (no steps required) that leads directly from this platform to the new Gateway Parking garage. The next entrances aren't until the northern ends of the platforms. Here at the end of the New York-bound platform, the high-level portion ends with a modern flight of stairs down its original low-level before a staircase with much older banisters leads down to the west side of George Street just before it crosses beneath the viaduct. 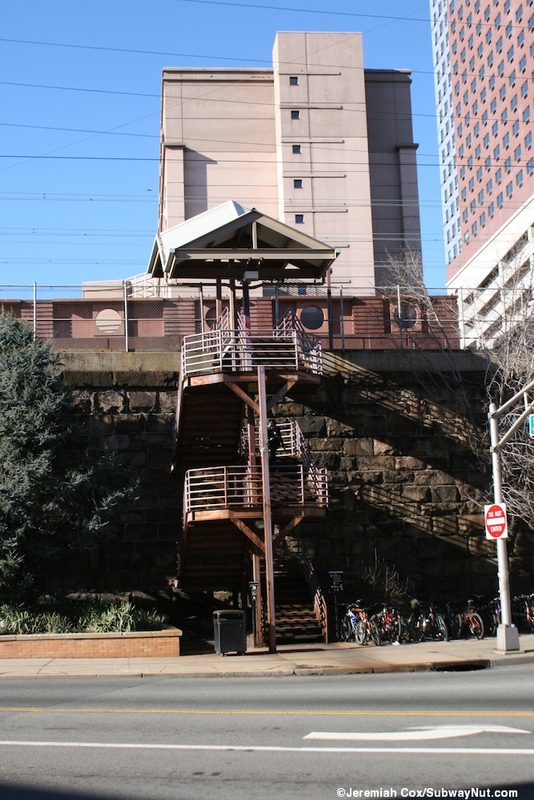 The Trenton-bound platform has its elevator at this inconvenient location, just before it ends and it has a modern staircase (a short ways before the actual platform ends) at the SW corner of George and Somerset Streets.